There’s something so refreshing about entertainment that tackles larger issues within the black community. Getting to see black people live out their full lives, all while staring down racism, microaggressions, police brutality, modern-day segregation, biracial identity, sexual identity, abortion and more, is something that’s becoming far less foreign. Netflix’s Dear White People has returned with a second season, Dear White People Vol. 2, and this season takes everything the black students from Winchester endured and amplifies it. Last season, we watched Reggie Green (Marque Richardson) face the barrel of a police officer’s gun at a party, Samantha (Logan Browning) struggle with her black identity after being exposed for loving a white man, Joelle (Ashley Blaine Featherson) mostly want to not be the dark-skinned sidekick, and Lionel (DeRon Horton) being stuck between identifying himself as a gay man and investigating racist issues at Winchester. What I love most about the series is that each character gets a chance to have their stories told through each episode, or chapter. So we get a chance to immerse ourselves in each character’s life. That, in and of itself, is exhausting. I know because I live it every day, so watching it as entertainment isn’t ideal, but such is life when we ask for representation, no? Season 2 isn’t all heavy; it does sprinkle in some fascinating and hilarious cameos, like Lena Waithe, Tessa Thompson, Tyler James Williams, Giancarlo Esposito, The Read’s Kid Fury and rapper Saweetie. So what are you in for this season? Allow me to break it down by character. Sam is the series’ main character as the show centers on her and her campus radio show of the same name: Dear White People. In this season, Sam faces her breakup with Gabe (who called the cops to the party where Reggie ended up at gunpoint). She spends much of the season stuck in a very relatable rut. At one point, Sam refuses to shower because clapping back at a racist Twitter troll is much more enticing. Sam’s issues are all in her head, causing her storyline to feel clunky and laborious. This is an incredible feat to pull off, considering how short the episodes are and how there’s comedy laced throughout the series. Where there is Sam, there is drama. From reconnecting with Gabe to dealing with the death of one of her parents to joining forces with Lionel to uncover Winchester’s secret societies, there’s no shortage of work to be done for our beautiful, green-eyed protagonist. He’s been the moodiest character, often brooding over his feelings since the confrontation with police. Reggie is still processing what happened to him last season, and so are we. It’s revitalizing to see a show like this take on mental health through the lens of the black man. We’re often not able to see a black man be vulnerable and in pain on-screen, but Reggie embodies both quietly. And while Reggie is processing, we see him experiment with the types of women he’s attracted to, open up to Gabe and finally give Joelle the time of day, although not without obstacles. However, this season, Reggie exhibits the least amount of growth, unless you consider “golden boy” Troy. 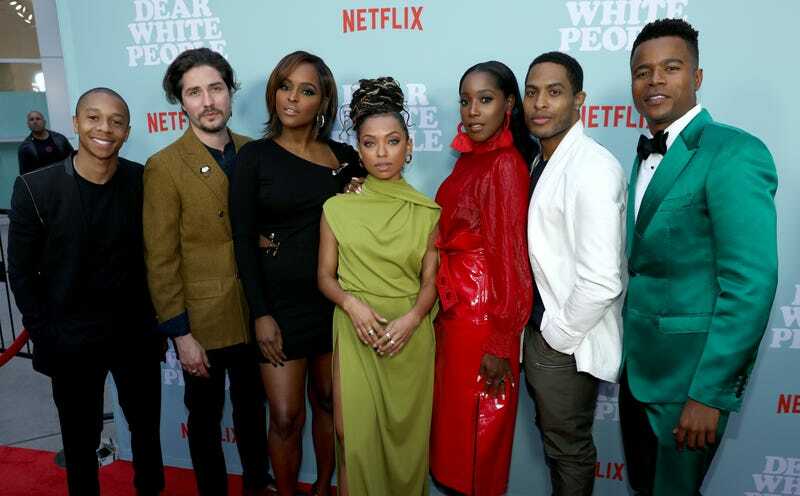 The Dear White People series has never been about amplifying the voices or stories of the popular; it revels in telling the stories of the minority. Within the black students at Winchester, Troy stands out as the big man on campus. This season doesn’t really explore his character, beyond his being depressed following his arrest and subsequent fall from grace. The dean’s son is suddenly a handsome loser who spends most of his days avoiding his every responsibility and getting high. Perhaps one of the series’ most interesting characters, Lionel is still knee-deep in navigating the dating scene as a gay black man and reporting the stories he wants to tell. With the school’s paper imploding in light of his giving the scoop about the blackface-party invite to Sam, Lionel teams up with Silvio (his former editor) to continue his investigative journalism around Winchester. But it’s Lionel’s investigation of Winchester’s secret societies with Sam that is the most ... confusing. Honestly, I have no idea where this storyline came from or where it’s going, but Lionel is committed, so I trudged through it with him. Coco is one of the lighter characters in the show as she bounces around like a black Elle Woods. One of the things I loved most about Coco this season is that we get to see that she clearly code-switches from school to home. Around campus, she’s Legally Blonde, but on the phone with her mother, she’s a diet version of that. Also in this season, Coco is faced with a major choice: have a baby or get an abortion. The agony over the choice weighs over her head and ours as she goes back-and-forth with her decision. So often, bright college girls are faced with this decision, and I love that Dear White People Vol. 2 doesn’t shy away from the controversial topic. Coco faces her choice with maturity. Since the first season, Jo has been a voice of reason and the all-around good girlfriend you want in your corner. She continues this character arc in this season, but this time, she also gets to be a love interest. Jo goes on dates (there’s even a date with a Hotep) and eventually gets some! Spoiler alert: It’s Reggie. Joelle better get that Black Student Union D! This season, you fall more in love with Joelle as she shares her singing talent, offers sage advice to all her ailing homies, and becomes the show’s most dependable character. And, yes, I left out the Gabe character because, quiet frankly, his character does nothing besides showcase his white guilt. Dear White People Vol. 2 packs a lot of punches in 10 short episodes, and perhaps that’s its biggest issue. It’s almost too much black culture in each episode. What?! How could I say such a thing?! But honestly, guys, there are Hoteps, n-words, racial profiling, white tears ... well, complaints, microaggressions, mixed-race hate, you name it. You end up missing references and moments because you’re focused on the last thing you’re still processing because feelings. I’ll maintain that I’m confused by the secret-society storyline, and since it’s streaming on Netflix, I’m going to watch again to see if it clears anything up for me. One of the best parts of the series is the shows that the Winchester students watch together. There’s an Iyanla Vanzant-esque show, there’s one that’s reminiscent of VH1’s Love & Hip Hop, and each time they come on, you get some obscure but extremely catchable black pop-culture reference. Issa Rae did something very similar in Insecure with the show’s show about slavery. Now, all this is not to say that the second season can be called amazing. It tries so hard to showcase the black experience in a sea of whiteness—which is most of our experience—but it kinda just does too much. However, the show is entertaining for the most part. I was very conscious about being too cute in season 2. We listened to our guts and we listened to our audience, and I didn’t think we had to be cute anymore. There’s an establishment in season 1 that I think sets you up for season 2. I don’t have to introduce you to Sam, or Lionel, or Troy or Coco anymore; now I’m going to introduce you to something else and you’re going to follow them. So this season allowed me to get a little messier with their story lines. Don’t let me ruin it for you. Watch Dear White People Vol. 2 now on Netflix!